Cloudy and cold today with wind gusts to 40 mph this morning falling off by afternoon. We could see some scattered snow showers around the lake. Tuesday through Thursday we will have sun and clouds with highs in the 30's on the upper mountains and 40's at lake level. Some warmer air moves in Friday and Saturday with highs in the 40's on the upper mountains, and 50's at lake level. Sunday another cold front moves through dropping highs back into the 30's & 40's next week. We could see some accumulating snow Sunday into Monday and from subsequent waves next week if they track far enough West to tap some Pacific moisture. Cold Weather. Warm Hearts. Hot Deals. It's a cold and snowy morning in the mountains and the valleys, with snow on the ground down into Reno. We saw snow showers last night and this morning as a cold front and subsequent low moved through. Watching radar we saw a heavier band setup NW of the lake over Squaw and Alpine during the early morning hours, as well as a lake effect band near Spooner Summit. The winds were out of the NW as the low spun South through Nevada, then switched NE this morning. That shifted the direction of the lake effect bands. 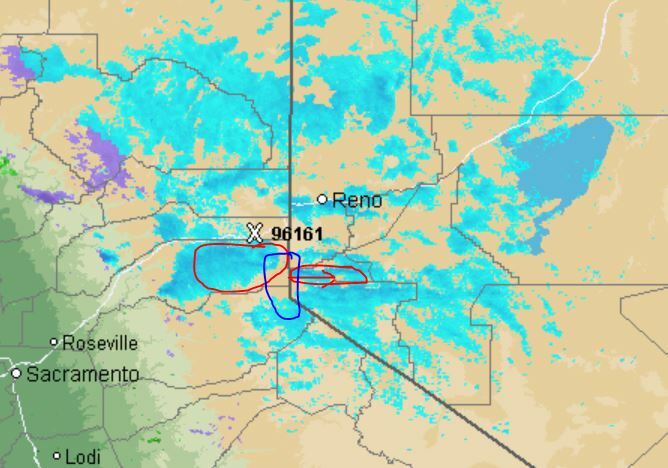 We saw a band coming off of Pyramid lake towards Reno this morning, and another SW of the lake near Emerald Bay. We have also been seeing some snow showers fire up on the East slop of the Sierra West of Reno and Carson from the East flow and mountain lift. That upslope snowfall will shift South this morning towards Mammoth. The showers should end around most of the lake by late morning. 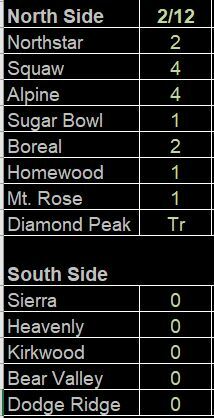 Here are the snowfall reports. North side of the lake we see the higher amounts that fell under that heavy band near Squaw with a report of 4 inches. Everyone else on the North end picked up the forecast of an inch or two. South side of the lake the snow showers moved in during and after morning reports. There were not many heavy bands so not sure if anyone will report an inch or two tomorrow morning. It's cold behind the front with temperatures in the teens and 20's this morning. Highs will struggle to get out of the 20's today. Wind sensors showed winds die off overnight, but this morning they have picked up to around 40 mph. That should back off again through the day. We have high anchored off the coast and a trough over the West. It looks like that may bet the pattern over the next 2 weeks. That will allow cold fronts and weak waves to dive South into the West side of the trough brushing us each time. The image above is from a cold front for Wednesday that will help to keep temperatures cool this week. This one looks drier like the one we saw Saturday, so not expecting more than a flake or two. We could see a brief warm-up Friday into Saturday as the ridge edges closer to the coast briefly. Then another cold trough drops in Sunday into Monday. This time the models are not in agreement on how far West the ridge is off the coast and the trough dropping South into the West. 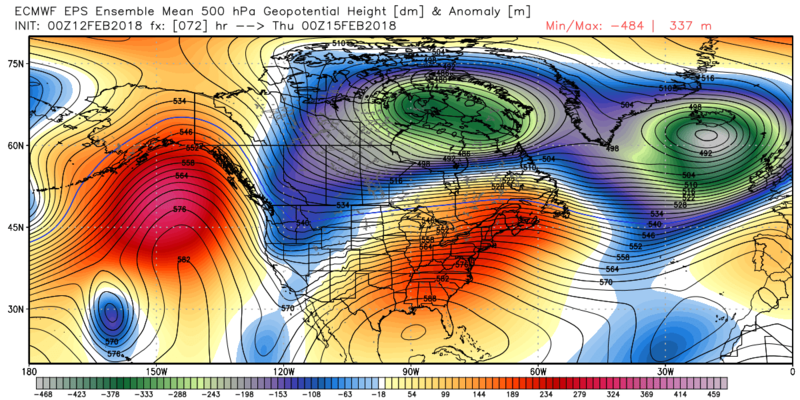 The European model above has the ridge out closer to 150w and allows the system diving South to pick up some Pacific moisture bringing up to an inch of liquid to the area. But the GFS is further East and only brushes us with a few showers at best. 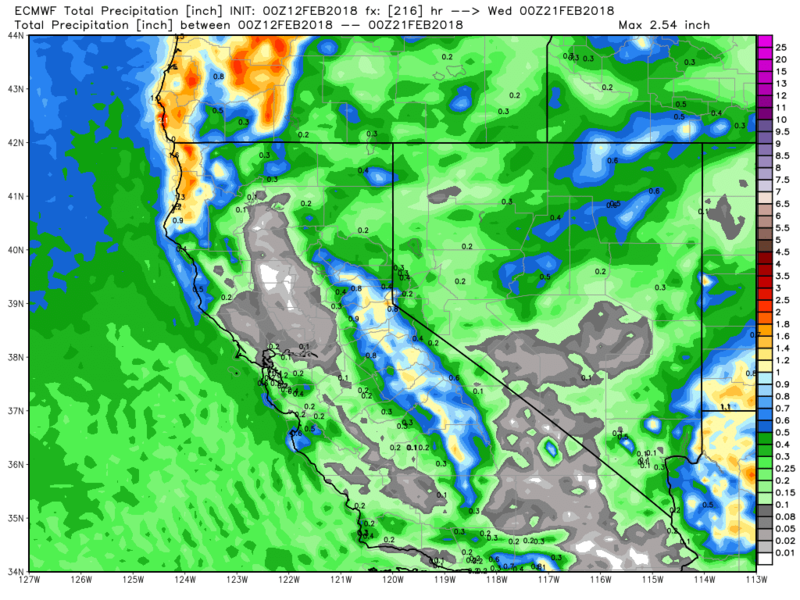 The European model has been consistent on a wetter scenario for days. So we will have to keep watching Presiden't Day closely all week. It looks like this pattern could last a while. 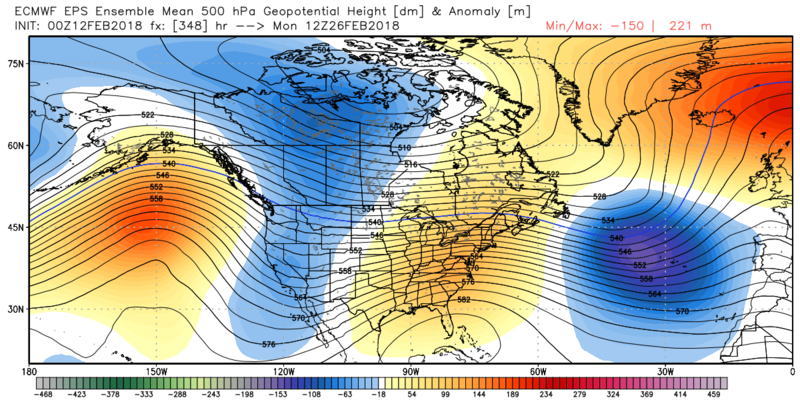 Here is the European ensemble mean forecast for heights out to the 26th. The position of the ridge in the East Pacific can make a big difference with these storms with the slightest adjustment. With the ridge near 140w we see dry systems drop down from the North over land like we are seeing this week. Out to 150w and we have a chance the storms move down the coast pulling in more moisture like the European model shows next weekend. Out to 160w and these cold storms grab a bunch of moisture and it's game on. Next week the European model has 2 waves, Sunday and next Wednesday that are closer to the coast and pull in some moisture that could bring several inches of snow. The GFS is drier. But then the weekend of the 24th into the week of the 26th the GFS shows the ridge further out near 150w with storms dropping down the coast pulling in more moisture. All we can do is watch each of these waves drop into the Western trough over the next 2 weeks, and hope some of them track far enough West to tap Pacific moisture. If not we just stay cool with dustings of snow. If some can then we could see the snow start to pile up from each next week and the week after. I have been saying that I have a feeling the last week of the month into March we will see the storm door finally open. No change on that feeling yet. Let's hope we can at least finish the season with a bang. 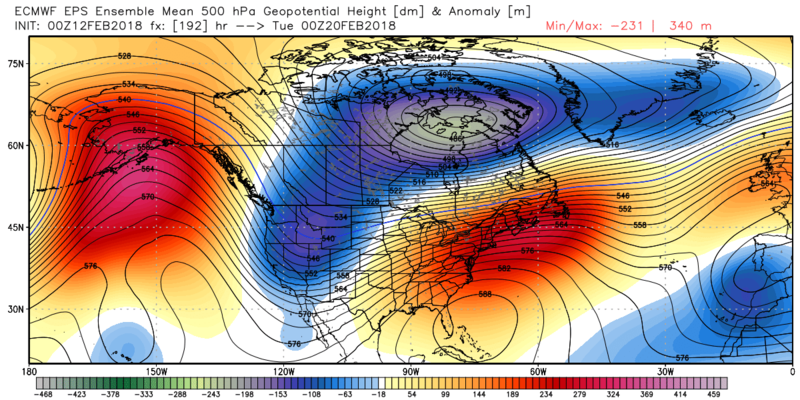 Bryan Allegretto has been writing insightful posts about snow storms for over a decade and is known as Tahoe's go-to snow forecaster. BA grew up in south Jersey, surfing, snowboarding, and chasing down the storms creating the epic conditions for both.